Learn the ABC's of catching - anything and everything you ever wanted to know about the catching position. Looking for Catcher's Gear? Check out this section for more info on catchers gear. Perfect your skills with an assortment of catching drills. Browse through a number of throwing, blocking, receiving, framing, fielding, and agility drills. Get faster and stronger. 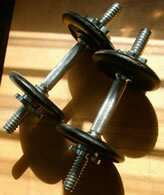 Develop your own strength training program. © 2010 www.Baseball-Catcher.com - All Rights Reserved.